In 1911, two explorers, Amundsen and Scott, embarked on a race against each other to become the first known human being to set foot upon the southernmost point of Earth. It was the age of Antarctic exploration, as the South Pole represented one of the last uncharted areas in the world. Amundsen wished to plant the Norwegian flag there on behalf of his country, while Scott hoped to stake his claim for England. The journey there and back from their base camps was about 1,400 miles, which is roughly equivalent to a round-trip hike from New York City to Chicago. Both men would be traveling the same exact distance on foot through extremely cold and harsh weather conditions. And both men were equally equipped with experience, supplies, and a supporting team of fellow explorers. But what wasn’t certain is how each of them would approach the inevitable challenges they faced on the road ahead. As it turned out, Amundsen and Scott took entirely different approaches to the very same challenges. Scott directed his team to hike as far as possible on the good weather days and then rest on bad weather days to conserve energy. Conversely, Amundsen directed his team to follow a strict regimen of consistent daily progress by hiking exactly 20 miles every day, regardless of weather conditions. Even on the warmest, clear-sky days, when Amundsen’s team was capable of hiking much farther, Amundsen was absolutely adamant that they travel no more than 20 miles to conserve their energy for the following day’s hike. Which team succeeded in the end? The team that took consistent daily action. Because what we do EVERY day defines us! Today’s progress is always compounded by yesterday’s effort, no matter how small. And it all comes down to the power of self-discipline. Think about the most common problems we deal with in our modern lives—from lack of presence to lack of exercise to unhealthy diets to procrastination, and so forth. In most cases, problems like these are not caused not by a physically present limitation, but by a weakness of the mind—specifically, a lack of self-discipline. We put the hard things off until tomorrow—because the “weather” is bad—until we’ve lost our edge. We grow accustomed to the idea that things should be easier than they are, and that waiting another day or two makes the best sense. Then one day we wake up and we’re emotionally incapable of doing the hard things that must be done. Let this be your wake-up call! Your mind and body both need to be exercised to gain strength. They need to be challenged, and they need to be worked consistently, to grow and develop over time. If you haven’t pushed yourself in lots of little ways over time—if you always avoid doing the hard things—of course you’ll crumble on the inevitable days that are harder than you expected. And if I had to guess, I’d say Scott’s team suffered in exactly this way. They tried to make things easier on themselves—the fantasy of “easier” became their mantra—their subconscious goal. But this fantasy was never going to be a reality during a 1,400-mile footrace in the South Pole. Scott’s team lost the race, not on the ground, but in their heads first. They were convinced that waiting made things easier. Don’t follow in their footsteps! Many great things can be done in a day if you don’t always make that day tomorrow. Take positive action and plant the right seeds in your life right now. Nature herself does not distinguish between what seeds she receives. She grows whatever seeds are planted. This is the way life works. Be mindful of the seeds you plant today, as they will become the crop you harvest tomorrow. So with that principle in mind, I want to share some key daily practices we’ve seen make all the difference in the lives of hundreds of our coaching clients and course members over the past decade—simple (but far from easy) things they do every day that ultimately move their lives and goals forward. And it’s no surprise that many of these practices directly or indirectly involve strengthening your mindset—because when we think better, we live better. Start letting go of unnecessary ideals. – When a thought comes to mind, ask yourself if it’s helping you grow or holding you back. Take back control. Make the unconscious, conscious, and let go of what isn’t serving you. This form of letting go is not giving up. It’s surrendering any obsessive emotional attachment to particular people, outcomes and situations. It means showing up every day in your life with the intention to be your best self, and to do the best you know how, without expecting life to go a certain way. Have goals, have dreams, aspire and take purposeful action, and build great relationships, but detach from what every aspect of your life must absolutely look like to be “good enough” for you. Just accept reality and then respond effectively. Focus on what matters—what moves you forward today—and let go of what does not. Start putting your heart and soul into the things you do. – There’s a big difference between empty fatigue and gratifying exhaustion. Life is short. Invest daily in meaningful activities. And don’t wait around! Too often we wait—because we think we need to “find” something new or different to be passionate about. But that’s not true. If you want more passion in your life right now, act accordingly right now! Put your whole heart and soul into the next thing you do. Not into tomorrow’s opportunities, but the opportunity right in front of you. Not into tomorrow’s tasks, but today’s tasks. Not into tomorrow’s run, but today’s run. Not into tomorrow’s conversations, but today’s conversations. I’m absolutely certain you have plenty in your life right now that’s worth your time, energy, and passionate focus. You have people and circumstances in your life that need you as much as you need them. You have a massive reservoir of passionate potential within you, just waiting. Stop waiting! There is no tomorrow. Put your heart and soul into what you’ve got right in front of you! Become it, let it become you, and great things will happen FOR you, TO you, and BECAUSE of you. Start stretching yourself just beyond the edge of comfort. – When you’re struggling to make progress, that’s when you actually are. Let that sink in. It’s far wiser to spend an extremely high quality ten minutes stretching yourself, than it is to spend a mediocre hour running comfortably in place. You want to be stretched to the edge of your ability at least once a day—it needs to be hard and uncomfortable for a little while. But most of us don’t want to be uncomfortable, so we run from the possibility of discomfort constantly. The obvious problem with this is that, by running from discomfort, we are constrained to partake in only the activities and opportunities within our comfort zones. And since our comfort zones are relativity small, we miss out on most of life’s greatest and healthiest experiences, and we get stuck in a debilitating cycle with our goals. We keep doing what we’ve always done, and thus we keep getting the results we’ve always gotten. And our true potential falls by the wayside. Choose differently! Go to environments that expand your mind. Spend time with people who inspire you to stretch yourself. Read books. Grow. Get better. Your life is your choice. Start taking more deep breaths, so you can mindfully collect more lessons for the long run. – It’s incredibly easy to overestimate the significance of a single decision, outcome, or event in the heat of the moment. But you must remind yourself to take a deep breath when things don’t go your way. Your results in the long run—good or bad—are always the byproduct of many small decisions, outcomes, and events over time. The truth is we all fail sometimes. The greater truth is that no single failure ever defines us. Learn from your mistakes. Grow wiser. Press on. Character and wisdom are sculpted gradually. They come with loss, lessons, and triumphs. They come after doubts, second guesses, and unknowns. The seeds of your success are planted in your past failures. Your best stories will come from overcoming your greatest challenges. Your praises will be birthed from your pains. So keep standing, keep learning, and keep living. Start side-stepping senseless drama. – Tune out the cheap shots people take at you along the way. Don’t waste words on people who deserve your silence. Sometimes the most powerful thing you can say is nothing at all. Seriously, before you waste it on anger, spite or frustration, think of how precious and irreplaceable your time is today. Give yourself a permanent break from the drama that can be easily avoided—just don’t engage in it. Life is just too short to argue and fight. Count your blessings, value the people who matter, and move on from the drama with your head held high. Remind yourself that calmness is a human superpower. The ability to not overreact or take things personally keeps your mind clear, your heart at peace, and yourself moving forward. Take constructive criticism seriously, but not personally. Listen to others, and then operate with your own intuition and wisdom as your guide. Start looking for silver linings. – The most powerful weapon against stress is our ability to choose one thought over another. Train your mind to see the good in the truth. Studies have shown that doctors who are put in a positive mood before making a diagnosis consistently experience significant boosts to their intellectual abilities than doctors in a neutral state, which allows them to make accurate diagnoses almost 20% faster. Similar studies of other vocations have shown that optimistic salespeople outsell their pessimistic counterparts by over 50%, and university students primed to feel happy before taking math exams statistically outperform their neutral peers. So it turns out that our minds are literally hardwired to perform at their best not when they are negative, or even neutral, but when they are positive. So think a little less about managing your problems and a little more about managing your mindset. Do your best to keep it positive. Start focusing inward more often. – Do your best to focus inward, as often as necessary, whenever you need a moment of clarity. And remember that your time spent focusing inward and finding clarity doesn’t just help you—your mind is powerful and your thoughts create ripples in other people’s lives. When you bring clarity into your life, you bring the best of yourself into everything you do—you tend to treat yourself and others better, communicate more constructively, do things for the right reasons, and ultimately improve the world you’re living in. This is why praying, or just meditating on some positive mantras, on a daily basis can actually make a real-world difference in your life. A heightened level of your conscious awareness—mental clarity—instantly elevates you in countless ways. And then interesting things begin happening—good things that are outside of your immediate purview—good things you haven’t even thought of yet. Start embracing your humanness and giving yourself more credit. – “Human” is the only real label we are born with, yet we forget so easily. To become attached to an opinionated label of depressed, divorced, diseased, rejected, or poor, is to be like the rain, that doesn’t know it is also the clouds… or the ice, that forgets it is water. For we are far more than the shape we’re currently in. And we, like the wind, water, and sky, will change forms many times in our lives, while forever remaining beautifully human. Once we fully embrace our humanness, it’s almost funny to see how quickly we outgrow what we once thought we couldn’t live without… and then we fall in love with what we didn’t even know we wanted. Take this to heart. And don’t forget to pause once a day and appreciate how far you’ve come. You’ve been through a lot, and you’ve grown a lot. Give yourself credit for the steps you’ve taken, so you can step forward again with grace. The next step forward is yours for the taking. Just pick one of the aforementioned points and start focusing on it for a few minutes every day. The key is making sustainable shifts in your beliefs and behavior. That means practicing each point gradually—one at a time, one day at a time, and then letting them build on one another. Go from zero to ten over the course of a few months, not all at once. As you marshal forward in life, adversity is inescapable. And it’s much like walking into a turbulent winter storm—like the ones Amundsen and Scott inevitably encountered on their race in the South Pole—as you fight to push onward, you not only gain strength, but it tears away from you all but the essential parts of you that cannot be torn. Once you come out of the storm, you see yourself as you really are in raw form, without the baggage that’s been holding you back. And that makes all the difference—because it frees you to take the next step, and the next. So tell me, which point mentioned above will you choose to start working on today? Why does it resonate with you? Your blog, book and emails continue to help me take the small steps forward you speak of. I am truly grateful. And although this whole post resonates with me in some way, I really love the little exercise you mention in #6. I just made my list and posted it up on my refrigerator where I will see it daily. Thank you for the best “How to” I’ve ever encountered! In 2012 within 90 days I lost my brother to suicide, mom to COPD, & dearest friend of 35 years to cancer. I began to lose the gray umbrella of grief, & was diagnosed with cancer, fortunately requiring surgery only. Four months later, my eldest son committed suicide which laid me out. Such good reminders, especially about the importance of upholding positive rituals and how greatly they effect our ability to think, live and succeed at what we’re working toward. I loved the story at the beginning and also how you wrapped it up at the end wight the analogy of ‘coming out of a turbulent winter storm’ — that gave me a needed visual. Anyway, I’ve been a student in your Getting Back to Happy course for 3 months now, and the whole idea of building tiny, life-changing rituals has benefitted both my professional effectiveness and my personal relationships. It’s actually quite amazing when I look back at how disheveled I was with everything and everyone that’s important to me, and how focusing on a couple simple, daily rituals snapped me out of the negative cycle I had been spinning in for years, in under 3 months. One step at a time, one day at a time, in the right direction, with the right support, and magic happens! So today, I’m going to press forward with the positive rituals I already have in place — just one more small step. Here I go . . . I think I will start with 7. Start looking for silver linings. This may be the most complicated, however I believe it will be the most beneficial, once this is conquered everything else will be a lot easier. This is by far my biggest challenge. Thanks so much for your words. Thanks for the emailing me the link to this post this today. I started with number 9 today.. I reminded myself to drop the crappy labels I’ve been subconsciously slapping on myself ever since my divorce last year. And I just set an alarm on my phone for tomorrow morning too, so I can repeat this reminder to myself. Thank you, again. You’re welcome, Demilade. Thank you for the positive feedback. Very inspiring. I believe we are pulled down by too much negativity. I will start taking one step at a time and one day st a time. Thank you! I need them all! So Im going to start with number (1) I really need to detach myself from a lot of people & things. To much to deal with. I’m going to start this process & take the first step with much prayer. Thank you sooooo much. A brilliant blogpost! I enjoy most your posts yet there’s something extra special about this one. Thank you. 10. Takes me right back to basics, put on my coat and start that walk, not focusing on how far but simply on the start! Often my sight is on the whole picture, this overwhelms and derails me – provokes anxiety and procrastination! Result – things get left undone – guilt and shame are the by products ! Thank you for the reminder today! What a fantastic article! Thank you. I am glad that the blog reminds me to keep moving forward. I know that I have been here before and remind myself it’s not forever. Glad to know that as long I repeat the phrase- I am a person who deserves love and respect and can give love and respect. These steps are very encouraging and practical. The human mind is at all times occupied with many ideals:necessary & unnecessary.#1 says:start letting go of unnecessary ideals.If we can stick to positive ideals and practice them and be true to our values and convictions we can make it in life.The steps are definitely practical and helpful.I find the steps rewarding. Beautiful story. Thank you for this positive and thoughtful post, it is very helpful. Wow! If this post was born out of your feelings of defeat I am in awe. This was such a poignant post. 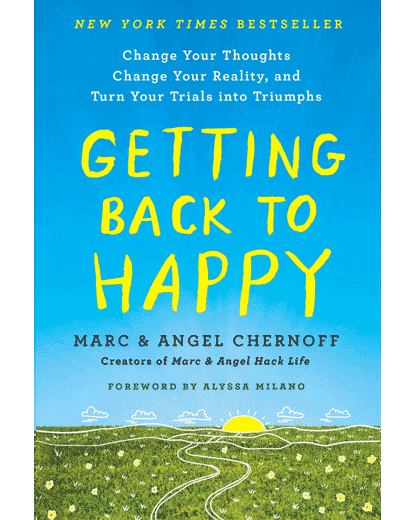 I will be keeping this one to re-read when I need that reminder of how to get back on track of living truly happy. Thank you for being you. Thank you for being human! Oh my God,Marc and Angel, I read this and afterwards cried like a baby….I am struggling so much due to my divorce, and being away from my 3 children for 2 years now…..they were my world…all I ever wanted…and I have no family to support me. Yesterday at work, I almost hung myself in a small wood that is nearby, after 2 years of constantly crying everyday I just had enough…….why didnt I???? Because at the very last moment I realised how exited I am about some recording that I have being produced… (I sing)…..it gave me out of all my darkness something I wanted to hear.. It stopped me from taking my life…….and then I woke and read this……..I will strive to be as strong as you both, you are amazing, and I love you both….Godbless you, sorry about my grammar, I have learning disabilities…. Please, please remember everyday is a new chance…at life, love, work, friends, whatever you might not have right now. Please stay with us, you will miss out on so much and so many will miss out on experiencing you if you don’t stay. Please, Andy, stay. I am so glad you decided against a permanent solution to temporary problems. Always remember that you are infinitely precious & valuable to this path of life & those who encounter you each day. You make a difference to me & I don’t even know you! Too often I stay busy by “going through the motions” just to get things done. But what if I did fewer things, and did those things with more heart and soul? Today I will do that and see how it feels. Thank you for the awesome list of actions I can take every day to make progress. Wow! Thank you for this post. All the points make so much sense to me. I know I really have a problem with procrastination. I have to make an effort to go out of my comfort zone and start with little beginnings. I liked the phrase, “…we are far more than the shape we are currently in.” It’s a little play on words. I found that amusing, because people talk about “getting in shape” or “I wish I were in better shape.” But you were adding to those common phrases by saying water is many different things, but it’s basically still water. are many different things through our lives. I think I have habitually defined myself by my failures, and forgotten that I’m basically human. I will take many shapes over the course of a lifetime. I get to be human. I get to live this life and be conscious of my choices from day to day. The point that resonated the most with me was “spend 10 quality minutes pushing yourself rather than running comfortably in place for an hour”. I am training for an Ironman distance triathlon (2.4 mile swim, 112 mile bike, 26.2 mile run), and the training is really hard. Just yesterday I did a 5 1/2 hour bike ride, 74 miles. And my coach suggested that every hour I spent 10 minutes just trying to ride faster. And it was successful. And then today, your quote about just pushing us yourself for 10 minutes… It just made a ton of sense. The idea that when we are struggling to progress that’s when we are actually progressing… What a great idea to keep in mind. Thank you. Thanks alot for directions to stay at peace of mind and steps ahead to be taken positively. Often a confused state of mind is refreshed through your such versatile directions. I am following point #5 by the time I read it out. Best blog, Thank you for posting. It’s so important and I forgot sometimes the fact that all we are humans. Bringing humanity back into our lives suggests all of the things you noted about being human- compassion, kindness and unconditional love chief among them. These appear to be things most lacking today, and without them, all of these other problems you noted seem to take root, and the negative cycles continue to grow, like a cancer. Our humanity is truly key in healing ourselves and cultures across the globe! This article focuses on problems which are too closely related to our lives. Thanks for such a fantastic and effective remedy for mind. Glad, I read your post today. It inspiring me lot. What I want say is thank you very much. Thank you for this wonderful article. I am so glad that a true friend emailed it to me. I am truly touched by this. I am going to write down my values and place them on my working desk to be always reminded of my values that I want to build my life around them and I am going to start my journey, one step at a time. But strong and consistent ones. Thanks for this very timely blog post. I have just changed cities and starting afresh looking for a career change and needed these reminders. Particilarly #5 and #6 of avoiding drama and staying true to my values keeps me going! Calmness is my superpower. Mid argument/discussion with my teenage son, I remembered my superpower and we all feel so much better. Thank you. Absolutely brilliant illustration (Amundsen and Scott, explorers) for the effectiveness of a little bit everyday…When I think back of some of the things I have accomplished, it was because of doing something EVERYDAY, even just visualizing the accomplishment or writing down 30 times the end accomplishment. Thank you so much. I share your posts often – This story really resonates with me – l talk about how much l can do when l am “on”, and berate myself when l am not ( lm working on stopping this ) … action whether on or off is perfect… some days are brilliant, and the others are still a blessing. I have your book on our reception desk for our clients to read (l bought one from me and one for anyone interested); very often l find a client reading it with a smile on their face, and usually taking a screen shot so they can visit you online. I enjoyed this post today. I do not know how I have been touched by you but I am very grateful for the positive reminders you offer. I have recorded #6 because I know that this is not easy to do but I have never found life easy but I have found it wonderful. I have a wonderful Father in Heaven who knows ma and loves me for what and who I am. He has always been right there with me and I am blessed. I just signed up for your email and look forward to receiving them. For years, I’ve always taken care of everybody else. I would feel selfish if I put myself first. As time went on my health started to suffer . It became to hard to reclaim what I had lost. I would never have thought that my life would have ended up in such turmoil. Marc and Angel, you guys have opened up my eye to see that I need to take back my lifestyle. All of the blog apply to my life. Thank you! I love you guys. Beautifully worded. It was a nice reminder to focus on what is important and meaningful. A great read to end the day! Thank you! This helped me a lot! Keep up the good work, look forward to you enlightening me! I really felt invigorated and enmeshed in this story perspectives and highlighted points it offered; I will continue to reread it again and again. Great post! Side stepping other people’s dramas is mine. I’ve had lots of tests with this over the past year. I appreciate your insights. I always start my day reading your blogs. I always get something that I can relate to. This is a good one for me. I need to remember to slow my thinking down. Sometimes my mind feels like I’m in a war zone. So when it gets that way. I will bring it back much faster by remembering to take one day at a time and to stay where my feet are on each day and to just enjoy what is. Practicing mindfulness helps a lot for me, also. Helps me to be in the day I’m in. Not what happened yesterday or what will happen tomorrow. Just to enjoy the day I’m in with no expectations. and I do ask God each day to help me get through the day. It is really beginning to help. As long as stay out of the drivers Seat. Thank you for another wonderful blog. I start each day by reading it. And I always can find many things I can relate to! Thank you , so much M&A. Your emails always arrive at the exact moment it is needed the most. This is SPECTACULAR! Someone I love dearly is struggling in so many of these areas . I feel like this post was written just for him. I did forward him a copy and did ask him to promise me he would read the entire thing. I know if he does the things you suggest on a regular basis his life will turn around. Thank you for giving me the opportunity to share this wonderful information. Reading this inspiring post felt like remembering all of them at once. Smile, share, seek and strong. Success is hidden in your past failures. Today’s progress is due to yesterday’s effort. Two great words. Thank you for this post. So needed.